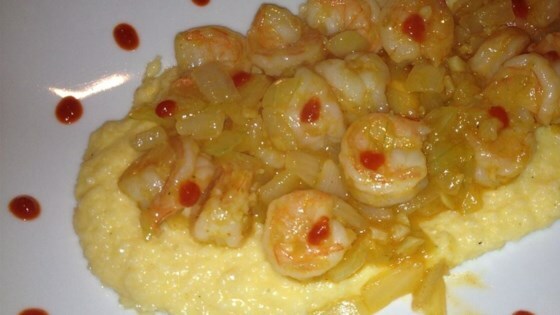 "Shrimp cooked with garlic and onion are served over garlic cheese grits. This is a dish for garlic lovers. Serve with garlic bread, or your preference of bread." Bring chicken broth, milk, and 1 teaspoon garlic to a boil in a saucepan. Stir in grits, reduce heat to low, and simmer until thickened, about 5 minutes. Remove from heat and thoroughly mix in Cheddar cheese; season with salt and black pepper. Set grits aside and keep warm. Heat butter and olive oil in a skillet over medium heat. Cook and stir onion and 2 teaspoons garlic until softened and beginning to brown, about 5 minutes. Stir shrimp into onion mixture and cook until shrimp are pink and no longer translucent in the center, about 5 more minutes. Stir in hot pepper sauce. Serve grits in a large serving bowl topped with shrimp mixture. OMG One of the best dishes I have make in a long time. So good. I highly recommend. And so easy to make.